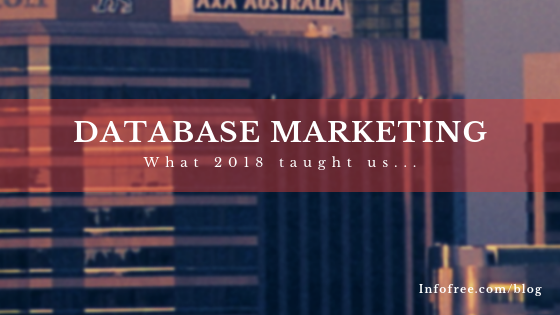 2018 soon will be a year that was and in the last days, as it tiptoes out, our experts spent time and effort to sum it all up for your marketing team. One of the most important topics addressed when in lead generation marketing strategies. We didn’t list an exhaustive list but important to keep in mind are: Lead Generation Can’t be Tracked; Qualifying Leads Don’t Matter; Quality Landing Pages are a Waster of Time; Social Media No More Effective in Lead Generation; Webinars are a Waste of Time for Lead Generation; Loads of Own Success Stories Needed. While dealing with social media strategies, we did stress on different approaches for various platforms but the underlying factors of the strategy were: Encouraging feedback and comments; listening to complaints – if any and taking remedial measures in the shortest possible time; geographical targeting; demographical fishing for enhanced reach; using small budget ads where possible and gated content from experts to make your brand as the leader of the pack. In the real world, in addition to the age-old methods of emails, cold calling and such, some unorthodox methods were highlighted. The experts have also recommended using solution highlighted languages – in all dealings – at all stages; planning and delivering with optimized solutions; never giving up easily and changing the strategy midway; making sure to reach back in the least possible time to prospects’ asking for a clarification or just more information. In the virtual world, there are simple but also proven approaches to rise above the clutter of competition. A highly professional home page, different landing pages for popup offers or Call To Action (CTA) options; webinars and follow-up with raised questions and queries; expert commentaries on subjects of concern in your business domain; running quizzes, contests, and engagements – were just some of the pointers to note. Your team should keep an updated funnel by using free CRM tool and the emails from the lists provided by Infofree.com, where the business database has 95% accuracy and consumer database approximately 90% accuracy. Thus your funnel will stay healthy and focussed. Finally, a very important task this week is to take a thorough inventory of your toolbox and check which ones worked and which need replacement in the coming year (next week onwards). Some of your strategies haven’t yielded desired results so make a note of it and let your experts decide if those need deletion or fine-tuning. Overall, be assured that 2018 is over and you can learn and move ahead. This entry was posted in infofree SMB Blog and tagged Database Marketing, email marketing, entrepreneur, Find New Customers, grow my sales, increase my sales, infofree.com, lead generation, mailing lists, Sales Productivity. Bookmark the permalink.